Learn how to interpret the different components of your credit card statement. 1. Account Number: Account number should same as your credit card number, but if you reported lost / stolen / non-receipt of your credit card and asked for replacement, the account number and credit card number will be different. 2. Credit Limit: This indicates the combined credit limit share amongst all the cards you own including supplementary credit card(s). 3. Statement Date: Statement date will recur on the same day of every month, and all of your posted transactions spent on last 30 or 31 calendar days since from last statement date would display on this statement. 4. Statement Balance: The total outstanding balance of your credit card dated on your statement date. If there is “CR” sign in front of the amount, which means your credit card remain credit balance as of statement date. 5. Payment Due Date: If the full / minimum payment amount is not paid for by the due date indicated, late fee will be charged accordingly. Payment due date will be reflected as “Immediate” if no minimum payment was made for the previous statement. 6. Minimum Payment: Minimum payment indicates the smallest amount payable before the due date. If you don’t settle the minimum payment of your credit card statement, financial charge will be charged accordingly in daily basis. How is my Minimum Payment amount calculated? 7. Transaction Date: The date you physically used your credit card spending at related merchant. 8. Post Date: The date which VISA / Mastercard / American Express process the transaction settlement and billed on your credit card. 9. Overseas Transaction: VISA / Mastercard / American Express applicable exchange rate on processing date plus 1.95%. 10. DBS$ / COMPASS Dollar Balance Brought Forward: Total DBS$ / COMPASS Dollar available from your previous statement. 11. Current Month Earned DBS$ / COMPASS Dollar: Total DBS$ / COMPASS Dollar earned from current statement. 12. Current Month Redeemed DBS$ / COMPASS Dollar: Total DBS$ / COMPASS Dollar you have redeemed from current statement. 13. 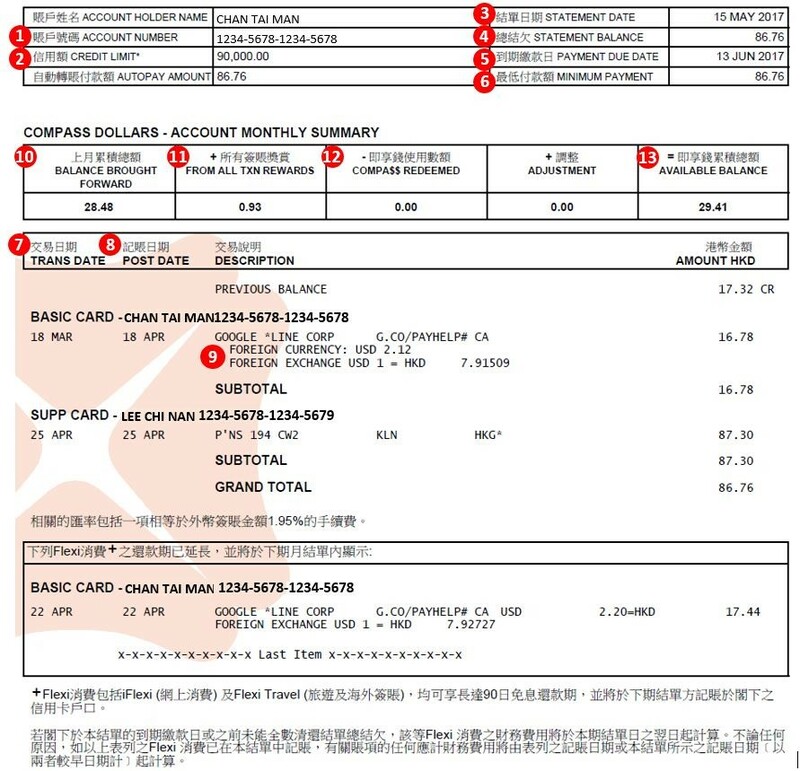 DBS$ / COMPASS Dollar Balance: Total available DBS$ / COMPASS Dollar of your credit cards (including supplementary credit cards) as of statement date.